Hi Friends!! 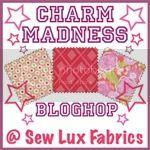 I'm so excited to be your June guest designer here on Sew Lux's blog! Today I want to share an easy peasy tutorial for a cute patchwork Boppy pillow cover- a great project or gift for EVERY new mom. 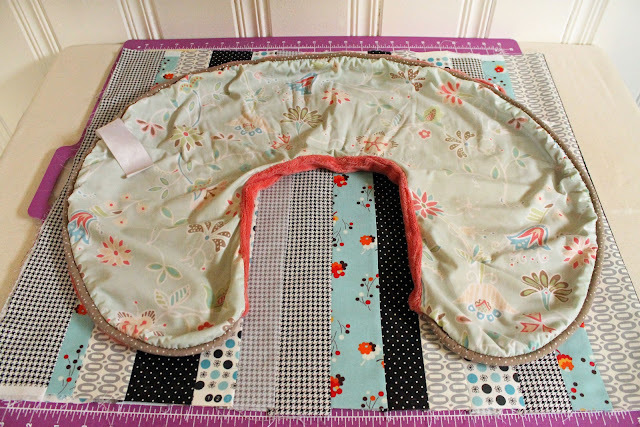 I can tell you from experience- the Boppy pillow is quite possibly THE single most useful piece of baby gear I own...for nursing, bottle feeding (yay dads! ), and also lounging/sitting babies. I don't know how mom's survived without these fabulous pillows! The girlie cover I used with my 2 daughters has seen better days, and with 2 bouncing boys on the way, I figured a new cover was a must for me! Unfortunately, the covers they sell for these pillows are...um...not cute. At least in my opinion. And they're pricey!! $10-$30 and SO generic. 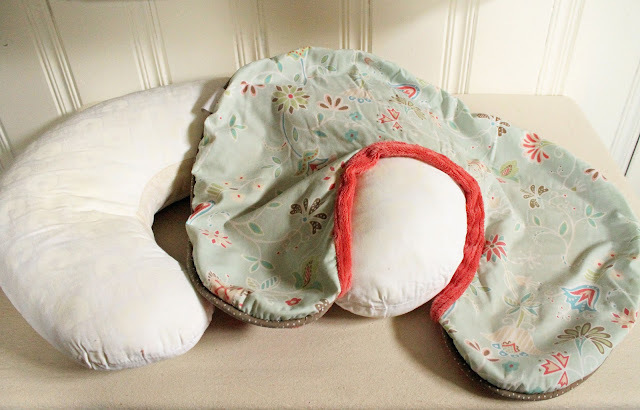 It's so easy to whip up a cute boutique-looking custom cover, for a fraction of the cost, that matches your nursery and home decor perfectly. 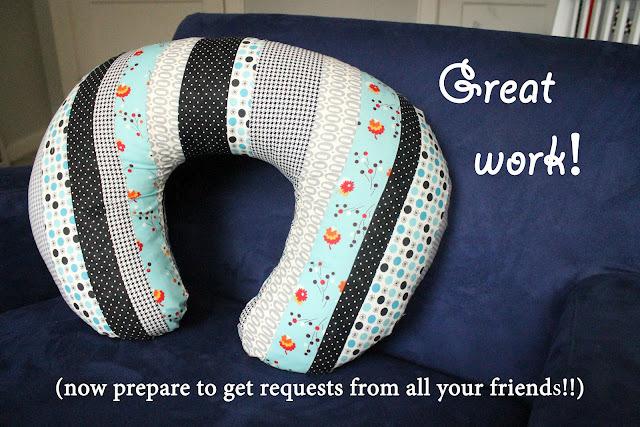 You'll also need an existing Boppy cover, or even just a plain Boppy pillow, to make a pattern from. (if you have a cover, I recommend using that over the pillow itself for better accuracy). 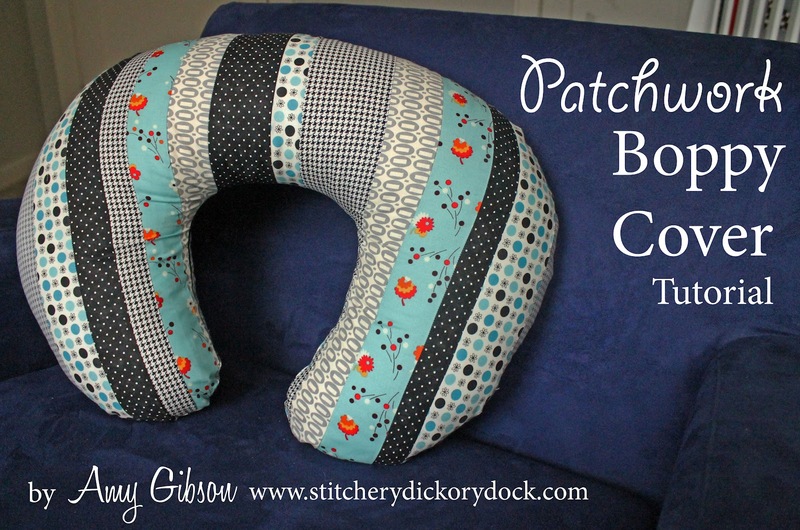 If you're making this as a gift and don't have a pillow or a cover to use, you can download a free printable pattern, such as this one by Prudent Baby (love that blog!). If you do print your pattern, you'll need to follow the instructions on the pattern to tape the pieces of paper together. 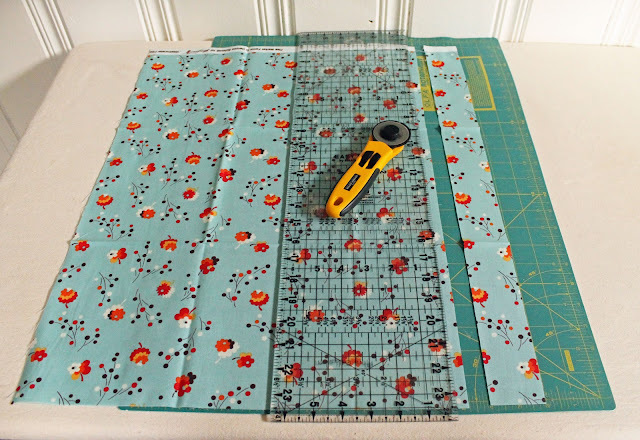 Start by cutting all 6 of your fat quarters along the longer side (22") into strips, ranging between 1.5"-3.5" in width. 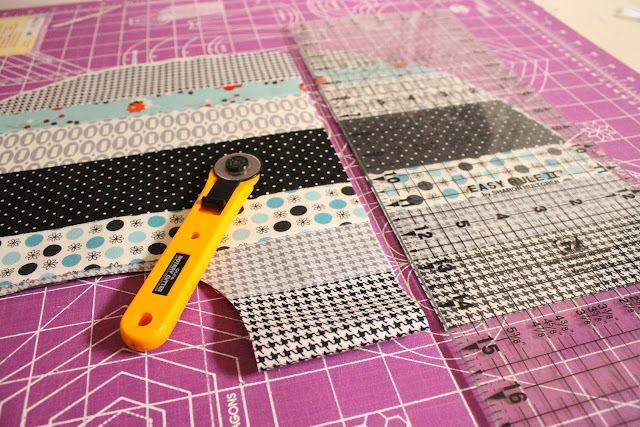 Just cut yourself a nice variety- start with 25-30 strips (you can always cut more if needed). Here's what I started with- 4-6 per FQ. 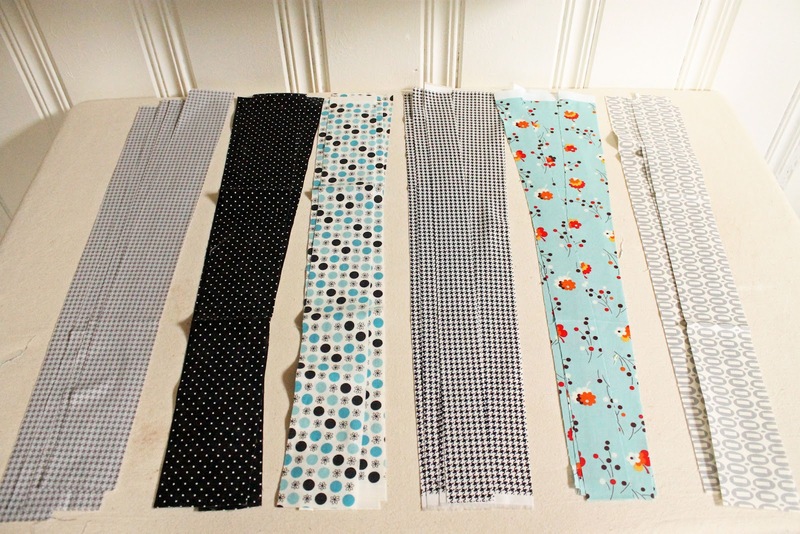 I ended up cutting a few more strips as I went. 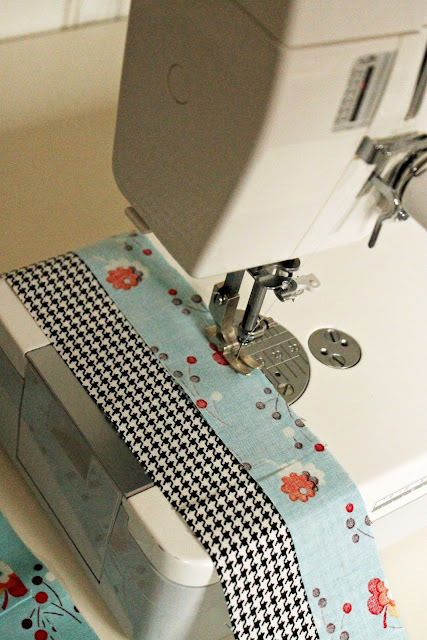 Now, stitch your strips together along the 22" edge, right sides together, using a 1/4" seam. I like to just put all of my strips next to my machine in piles by print, so that I can quickly grab the next one I want. No need to stick to a certain order- keep it somewhat random. Continue adding strips until your piece measures at least 53" wide. 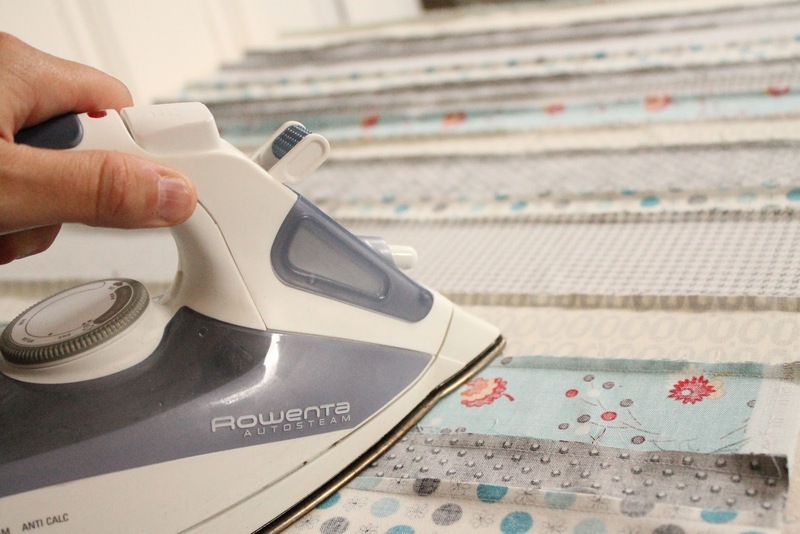 Press all your seams in one direction. Though I don't make it a habit to press on the wrong side, I do find this particular piece easiest to press from the back first with heavy steam, then flip it over to make sure your seams are all pulled taught. 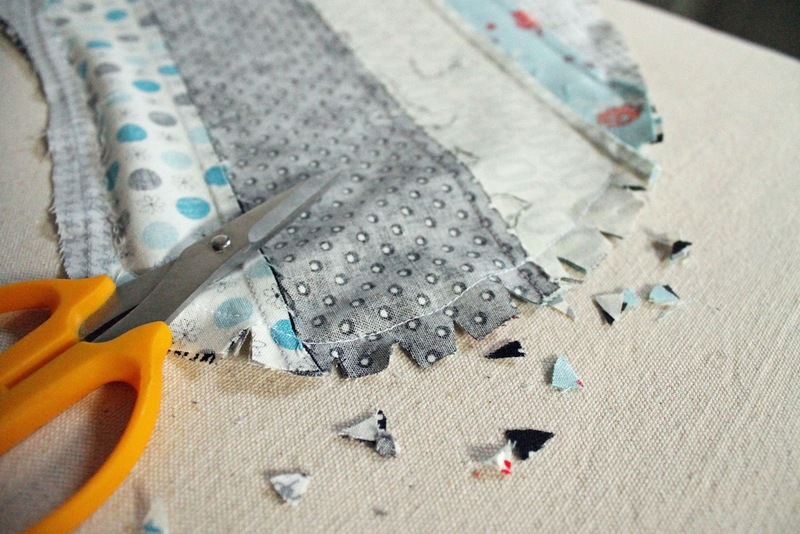 Now, fold your piece in half, wrong sides together, so that you have 2 equal layers of patchwork on your cutting mat. Place your pattern (either existing cover, paper pattern, or pillow itself) on top, making sure you have at least 1/2" excess on all sides. Now, cut around your pattern leaving a 1/2" of excess around the edge. Best to air on the generous side of 1/2", as you can always take your seams in later to eliminate any loose or baggy areas once it's on the pillow, but you can't add fabric that's already been cut. Now, remove one of your pieces. I repeat, REMOVE ONE OF YOUR PIECES....we're only working on one in this step to add the zipper. Line your zipper up so it's perpenticular to your strips, and so that the very ends of the zipper line up with the edges of your fabric. 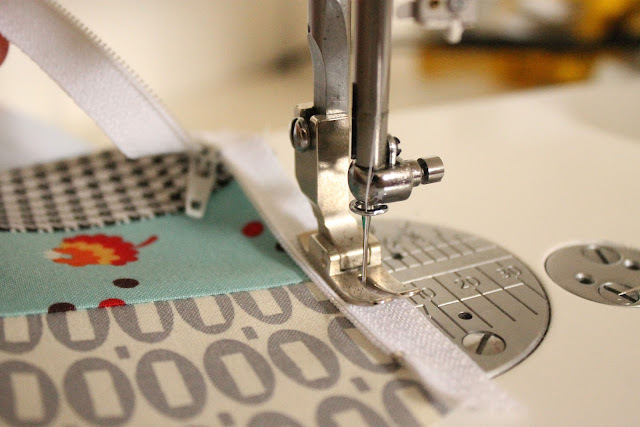 No need to measure anything, as your pattern piece might vary slightly from another's- as long as the very ends of the zipper fabric (not the clasp or metal parts), are at the edge of your patchwork fabric. 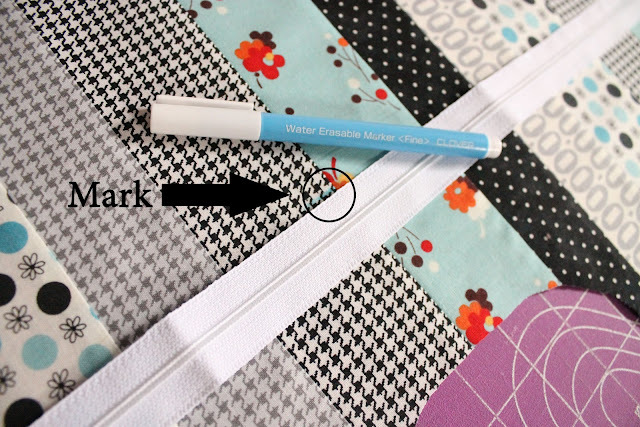 Make a 1" mark on your fabric, at the center top edge of your zipper- I used a water soluable marker. Now fold your piece in half, and align your ruler with the fold, and cut at the marking. Your piece should now look like this (the other piece is whole though, no cuts). 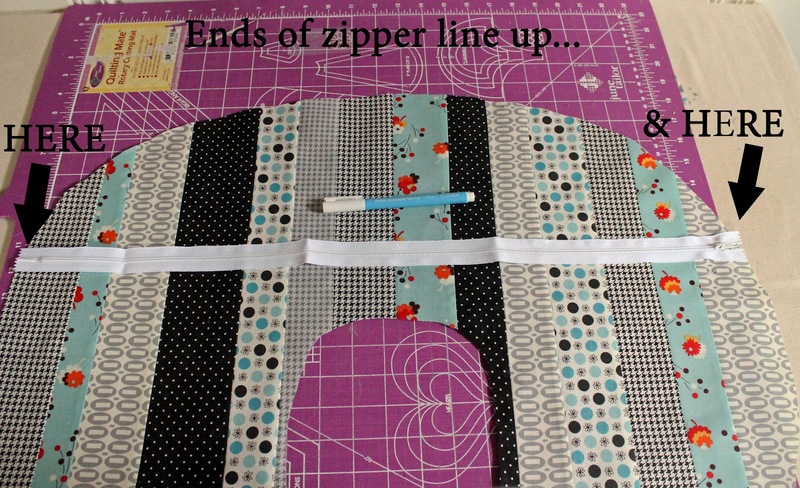 Now for the fun- zipper time!!! Place your closed zipper on the larger piece along the cut edge, right sides together (so the tab of the zipper is facing down)- pin. Now head over to your machine and stitch a 1/4" seam. If you have a quarter inch foot, you should be able to do this easily, without putting a zipper foot on (but if you have one and are dying for an excuse to use it, by all means do). I'd have to say I'm in the "never dying to use my zipper foot" category. ...Now, raise your presser foot, and unzip the zipper. Voila! 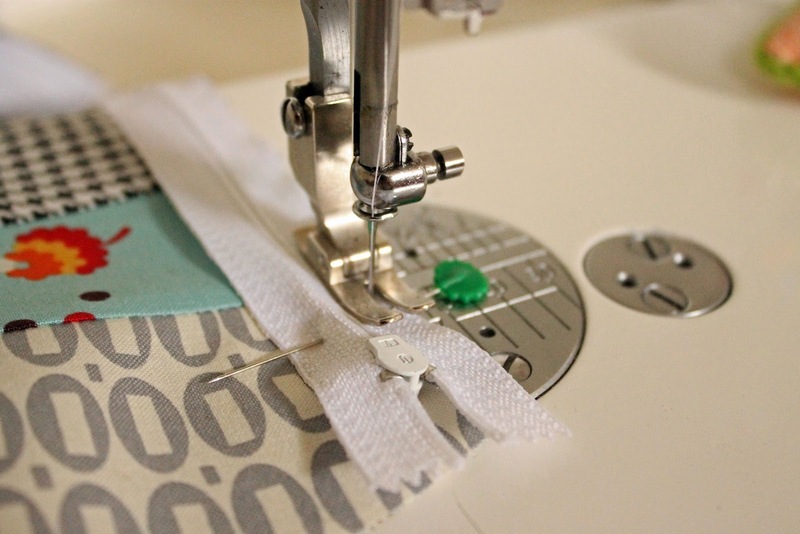 The bulky part is behind your presser foot and you can continue sewing your seam without having to battle with it. 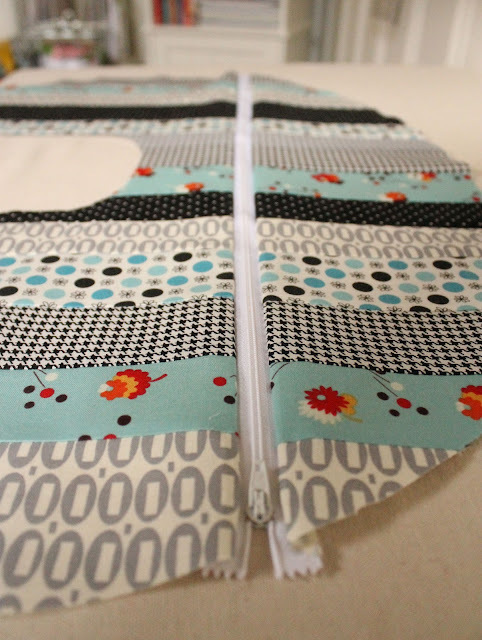 Next we just want to pin and stitch the remaining top piece to the other edge of the zipper. 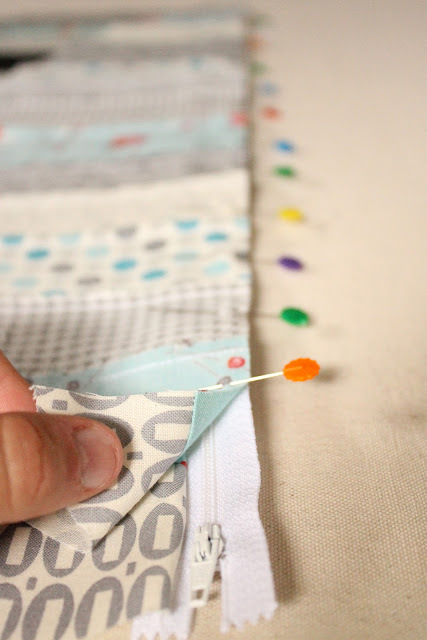 Fold up your zipper, so the tab is now facing up, and pin your fabric piece to it...stitch just as you did the other side, and you can use the same trick with the moving the tab so it doesn't get in your way. There you go- zipper in! Now wasn't that easy? One last step and then you're done!!! 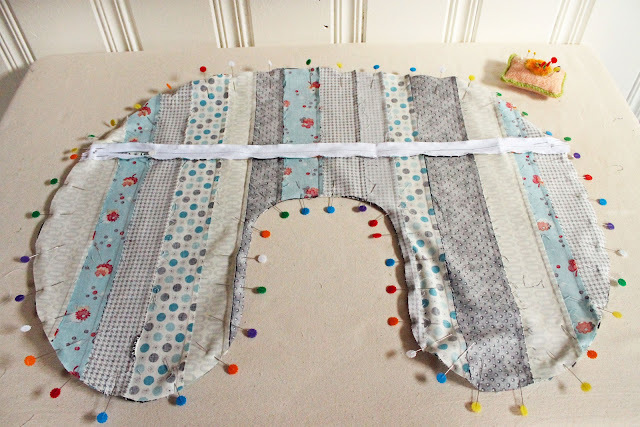 Layer your 2 pieces, right sides together, and making sure the zipper is a couple of inches open, and pin all the way around. 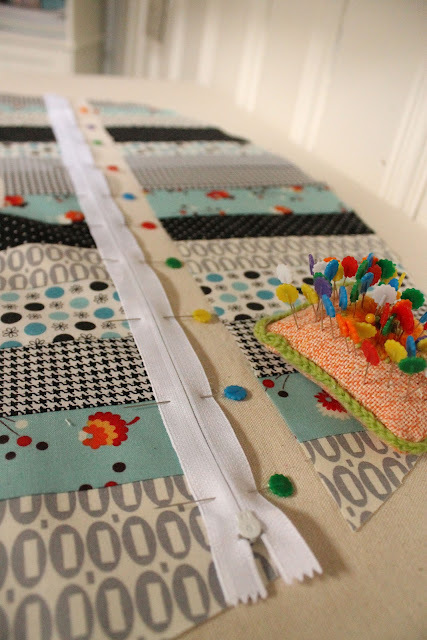 Be sure to put pins at the ends of your zipper so those be moving around when you stitch. 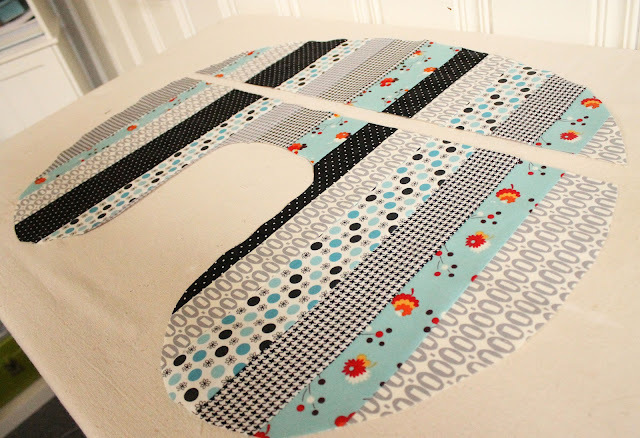 Now stitch around the entire piece using a 1/2" seam allowance. 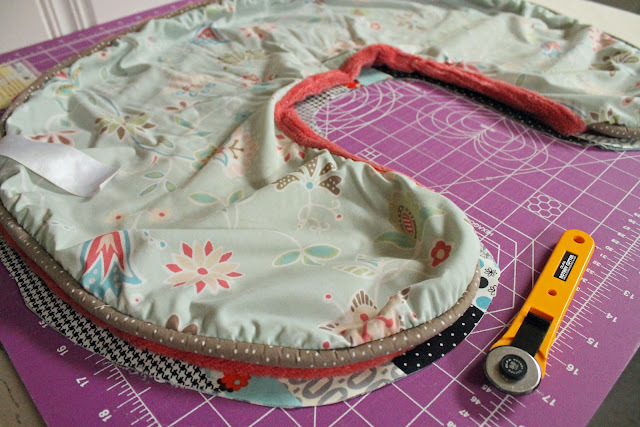 No need to leave an opening- you'll just open up that zipper to turn it right side out. Clip the seam allowance a bit along the roundest parts, to help the seam to look smooth, and turn that puppy right side out! 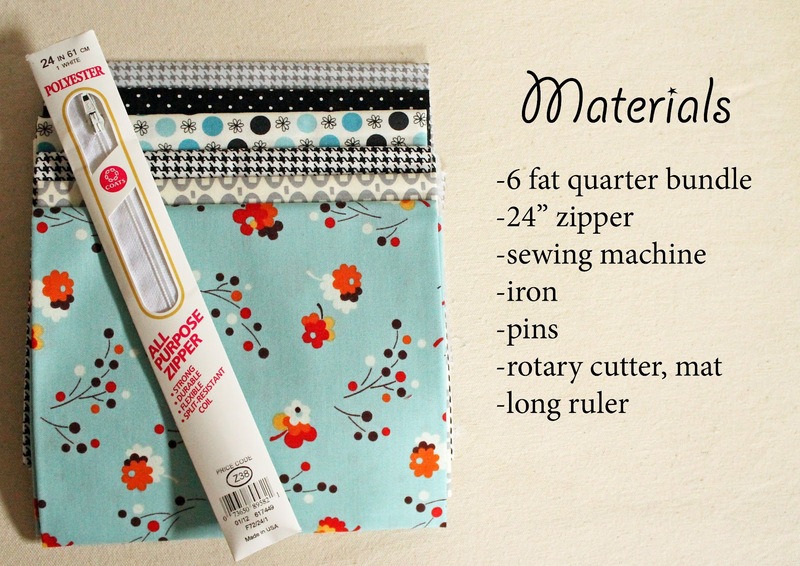 Hope you enjoyed my tutorial, for this month's Design Challenge here at Sew Lux! 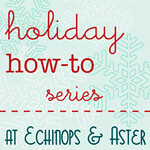 I'd love to hear from you, so feel free to pop on over to my blog and say hi!!! And if you like this particular fabric combo, don't forget to snag this limited-avail 6 FQ bundle over in Sew Lux's shop! The bundle is on sale through Sunday!!! This is adorable!! 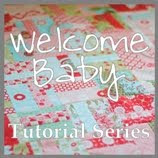 Definitely saving this tutorial for when I have kiddos! Love it! And you are right, the Boppy covers for boys are terrible. I will be trying this out this weekend. Thanks for the tutorial! Love this tutorial. I've never read a tutorial line by line on the first go round. For some reason I'm just taken by your fabrics and the ease of which you talk about zippers (I'm not a zipper fan). Thanks my dear! Looks great. I'll have to remember in case I ever need a gift. Great job!!! If I had one I would totally make a cute cover like this! Always nice to have a spare cover or two to swap out for washing out the inevitable spit-ups. I think your prints are stunning! I could see a pillow cover too. I have some of these prints. You have a wonderful eye for color. I really like your tutorials. So glad I found your blog. I'll be a happy follower. Parabéns e obrigada por compartilhar este tutorial! This is one I will try. 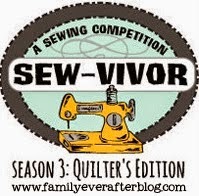 Thanks for tip on zipper installation! I just followed this one.... Worked out perfectly. The zipper came out perfect (I could never do that before!). I didn't to the strips of fabric, just used a yard, since I wasn't confident I could do the stripes well... Maybe next time! Thanks for helping me make a handmade gift for my cousin and her first baby! Looks fun. 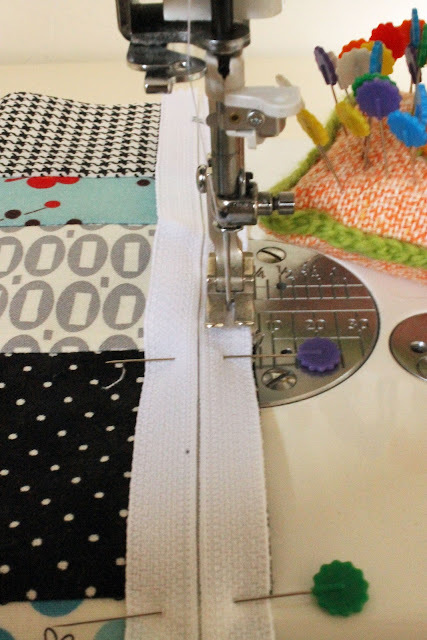 Wondering why you decided to do the final outside seam at 1/2 inch? Thanks! I just made this for my little girl coming next month. I added a ruffle trim and it looks so cute! I wish I was able to post a picture to share with you in the comments. 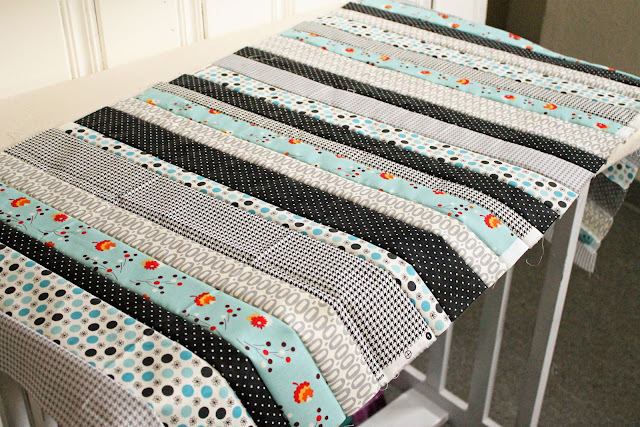 I will also add that while your tutorial is easy peasy, sewing all of those thin strips of fabric together is truly a labor of love that I'm not anxious to do again, ha!